2. Meanwhile, pour Alfredo sauce into a medium saucepan. Pour wine into sauce jar; cover tightly, and shake well. Stir wine mixture into saucepan. Stir in chopped tomatoes and 1/2 cup chopped basil, and cook over medium-low heat 5 minutes or until thoroughly heated. Toss with pasta, and top evenly with 1/3 cup grated Parmesan cheese. Garnish, if desired. *1 (13-oz.) package three-cheese tortellini may be substituted. **1 (14.5-oz.) can petite diced tomatoes, fully drained, may be substituted. 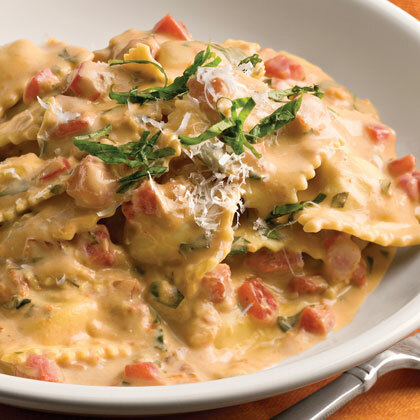 Note: For testing purposes only, we used Buitoni Four Cheese Ravioli and Classico Sun-dried Tomato Alfredo Pasta Sauce.